Leaf Spring Bushings be in control when maneuvering through turns, during standing start accelerations, braking and over bumps and berms. Allows the leaf spring system to function more effectively. For high performance applications, the combination of Heavy Duty or performance Leaf Springs and Energy's Polyurethane Spring Bushings deliver maximum benefit. 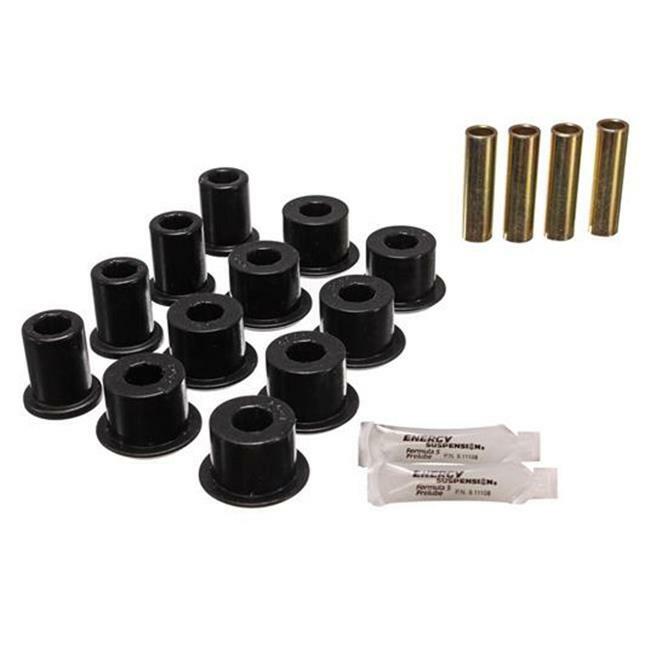 These bushings also improve lighter duty Leaf Spring systems, adding a higher degree of performance and durability. In either situation, you'll feel the difference in positive handling and control. Polyurethane is finally being used for Leaf Spring Bushings. For high performance applications, the combination of Heavy Duty or performance Leaf Springs and performance Polyurethane Spring Bushings deliver the maximum benefit. For lighter duty Leaf Springs they add a higher degree of performance and durability. In either situation, you'll immediately feel the difference in positive handling and control! Many sets come complete with Heavy Duty metal sleeves to add to the durability of the set. When applicable, many sets contain Energy's own pre-lube lubricant for smooth operation of the bushings.